What is a Bamboo Structure anyway? A Bamboo structure is a kind of Eco-friendly building or a green building. These structures that have little to no negative impact on the environment. Many Corporates and Architects are taking interest in Eco-friendly buildings or green buildings. These buildings are not only beautiful but also cost effective. Green buildings for Corporates and Government is a matter of choice. For us individuals it is more of a challenge. We desire structures that are more cost effective. Something like a Bamboo structure. How are bamboo structures built? Any structure completely made of bamboo qualifies as a bamboo structure. In any bamboo structure, the biggest challenge lies in the connectors. The point where two or more bamboo poles join. In the past entire structures were made of bamboo. 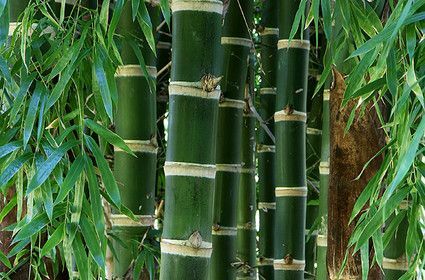 Even today in some parts of the world bamboo is grown and available in plenty. In places where access to technology is scarce, People build complete bamboo structures. In such places, traditional methods are used to connect bamboo poles. This is also known as bamboo lashing. We will learn more about bamboo lashing later on in this article. In the recent past, there has been an advancement in technology. A tiny amount of steel and other materials have made their way within a bamboo structure. Today modern connectors made of steel secure bamboo poles in place. The slight amount of foreign material makes the structure more stable and safer. The structure’s life is up to double the amount of time. All over the world there are close to 1500 recognised species of bamboo. Bamboo comes in all sizes. Suitability in construction depends on its mechanical properties. Not all the species can be used as construction material. In any place one species might be good over the other. In India architects prefer Bambusa balcooa and Bambusa bambos for construction. The South Americans prefer Guadua angustifolia and likewise. Like every other structure, a bamboo structure begins with a foundation. Bamboo columns or beams support the entire structure. The walls covered by bamboo sticks or woven bamboo mats. The roof consists of a Bamboo truss, a framework make of bamboo poles to support the roof. Once the truss is ready, the roof is covered. Covered by woven bamboo mats, corrugated bamboo roofing sheets or halved bamboo clums. You might want to hire a team. A team of artisans, craftsman, architect and engineer for a functional bamboo structure. It is best when a team of experts do it. But, if you’re considering a mini bamboo structure as your next DIY project then there is huge potential. These are not complete bamboo buildings. 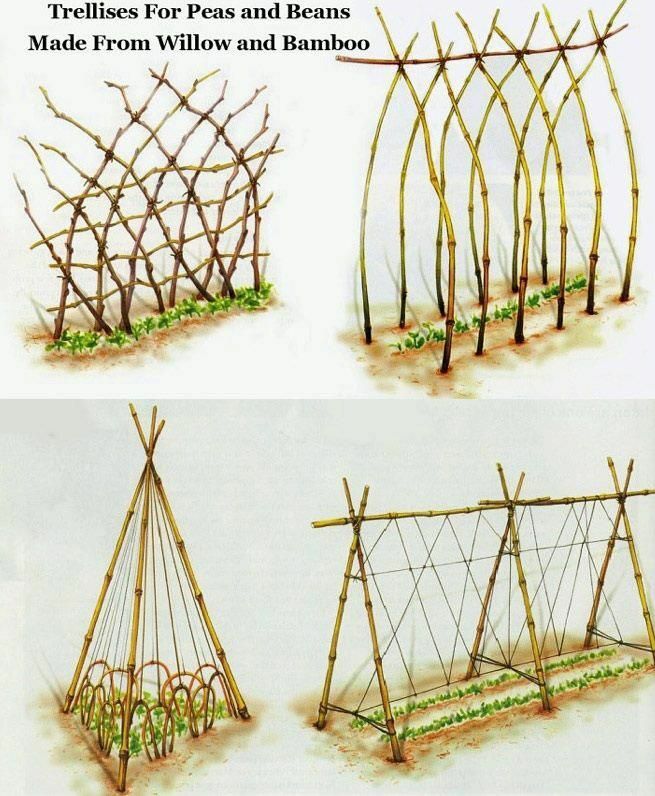 But can be a fun bamboo structure to start with. Let’s look into how to make one of these structures. 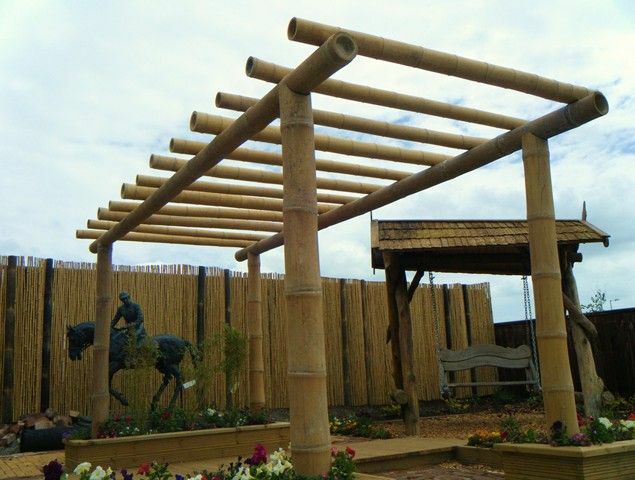 A bamboo pergola is simple yet beautiful structure. Four strong bamboo poles placed vertically 3 to 4 meters apart or as desired. The poles are partially buried in the ground. This is the foundation of the structure. Eight bamboo poles connected on the top of the vertical poles in an interlocking manner. The poles are secured with Bamboo lashing or mechanical bolts. Place bamboo poles on top of the pergola, each pole to be placed 18 – 24 inches apart. Secure the poles with bamboo lashing or mechanical bolts. Bamboo arbour is more or less like bamboo pergola. It may vary in shape, instead of a square arbours can also be made in hexagon. Bamboo arbours also come with a place to sit. Thus the extra bamboo poles or flattened bamboo can be used to make this seat. A bamboo trellis and bamboo fence is much simpler than the pergola. They are one sided. Which means that only two vertical poles are used for support and the rest goes into the designing. A Bamboo trellis is a structure made to provide support to small plants and creepers. Two vertical poles are used for the support system buried up to 6 inches deep. The poles are 3 to 4 feet apart. Two horizontal poles connect the vertical poles, one on top and the other on the bottom. The framework is ready. Between bamboos splits are put giving it a unique design. Bamboo Fence is much simpler than a trellis. Small bamboo poles of similar length are tightly stacked next to each other are tied with a cord. To achieve a fancy look poles of different sizes and shapes can be used in a fence. A lashing refers to a cord used to fasten something together. A bamboo lashing refers to a cord used to hold two or more bamboo poles together. 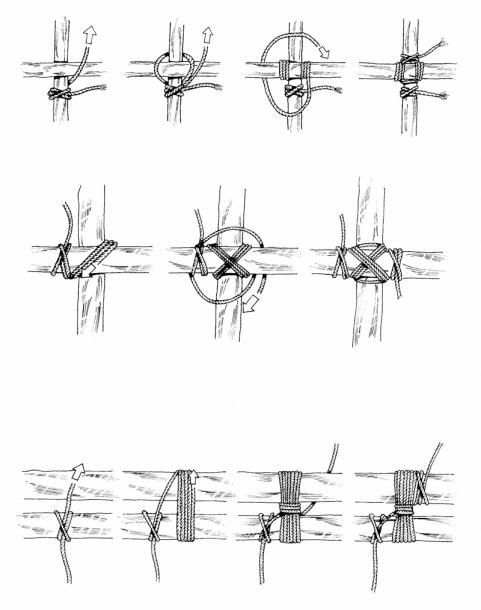 Square lashing: one of the simplest bamboo lashing technique is the square lashing. 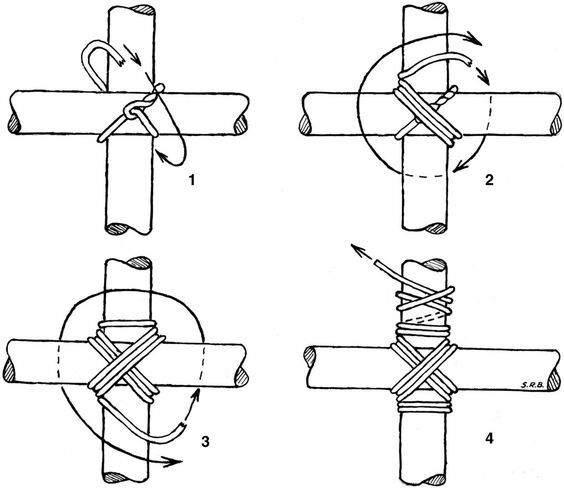 In this technique, two bamboo poles intersect in a cross formation. 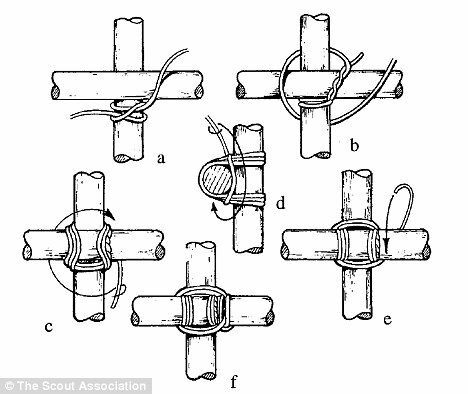 Start with a clove hitch in one pole and work around the other pole is a square pattern. End with another clove hitch on to the second pole to secure the cord. Diagonal lashing: In diagonal lashing, the starting hitch is tied diagonally. The cord is then wrapped diagonally over the poles. To secure the cord a clove hitch is tied in the end. Drilled lashing: This type of lashing requires a small amount of mechanical effort. A hole is drilled just over the bamboo section. 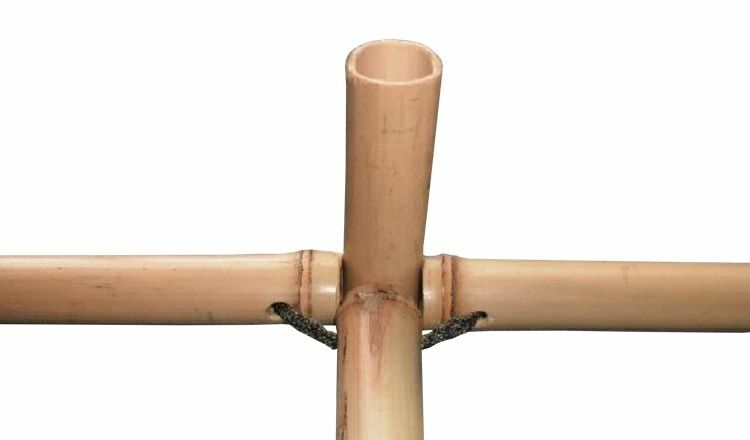 With bamboo poles held together in the desired form the cord is passed through the hole. The cord is then worked around the other pole. To secure the poles together a clove hitch is tied in the end. Drilled lashing can hold many bamboo poles together. In the case of many poles, a hole is drilled in all the poles. With all the poles held in position, a cord is passed through all the holes and secured with a clove hitch. There are several other lashing techniques. Each country has their own unique style of lashing. Japanese lashing technique, Philippine lashing technique are a few to mention. Bamboo is a versatile material. It goes well with any type of structure. Not just in construction, Bamboo can also be used in interior designing and décor. Bamboo flooring, furniture etc. are also beautiful looks wise. Bamboo requires little skill when it comes to construction. It is very easy to work with. It is also utilised to the fullest level and nothing goes to waste. Bamboo is eco-friendly material. A lot of resources are harmful to the environment are not being used by using bamboo. Bamboo is also hard and durable. Structures made of bamboo can last over a century. If you’re looking for a permanent housing solution then bamboo may come in handy. The need for painting and polishing is least as bamboo comes with a natural and good look. Bamboo is a flexible material and hence it is much more resistant to earthquakes. Bamboo has been around for a long time. Most of us don’t know but bamboo is also being used for construction for centuries. The North-eastern states of India, Japan, Thailand etc. and the tribes still use bamboo. They use it in the same way even today for construction, hunting, cooking, dance etc. the uses of bamboo are plenty. It is now that the western community and other Asian countries have started making use of bamboo. With bamboo and a little bit of mechanical equipment, bamboo structures can be built. These structures will also last us a century. The modern architecture has given us some amazing marvels. The marvels in Dubai are a living example. Bamboo has not been far behind. The recently surfaced stories show some amazing architectural marvels made out of bamboo. With the future of architecture so bright and bamboo spreading in popularity. What else will we witness? Only time will tell. Let us know in the comments below. Which is the best architectural structure you have ever seen? What is unique about it?